PBMS is proud to sell Mauritzon Curtain Walls. Curtain Walls can serve a variety of uses in the industrial, commercial, marine and automotive industries. They can create a barrier for confining dust, dirt and contaminants as well as controlling heat and cold loss, protection from paint, overspray or sparks. Use these curtains for climate control environments, awnings, space separation or dividing curtains for privacy, paint booth curtains or prep station curtains and more. 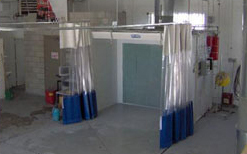 The Paint Booth Curtain Walls are hung on tracks that allow them to slide out of the way when not in use. Our custom curtain wall sizes can range from 10ft to 100ft high in any width and layout. They are available in a variety of colors at no additional cost. The standard curtains have a white vinyl top, a clear plastic window center and a blue vinyl bottom. Most curtains install easily with no need for special tools. Standard duty 13 oz or Heavy duty 18 oz vinyl coated polyester fabric are base fabrics. 20 mil, 40 mil clear PVC or weld-view tinted windows available. 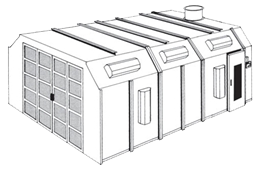 Vinyl material meets NFPA 701 (Large scale) flame retardancy and California Fire Marshal standards. 5% is added for curtain’s “Drape” and is automatically given at no extra charge. Double and triple folded hems for greater strength and durability. Double lock stitching with mildew/rot resistant thread as a standard. 2″ industrial strength Velcro closures between curtain panels. Fully enclosed, sewn in, galvanized chain in the bottom hem for motion reduction and improved appearance.